The first violin part from Beethoven's Egmont Overture, Op. 84 has been edited by Ilya Kaler, who has appeared as guest concertmaster with the San Francisco Symphony, Philadelphia Orchestra and Baltimore Symphony. Kaler's bowings, fingerings and other editorial markings have been added throughout the score. Beethoven's Egmont, Op. 84 is a set of incidental music pieces for the 1787 play of the same name by Johann Wolfgang von Goethe. It consists of an overture followed by a sequence of nine pieces for soprano and full symphony orchestra, with an optional male narrator. The subject of the music and dramatic narrative is the life and heroism of a 16th-century Dutch nobleman, the Count of Egmont. The Overture later became an unofficial anthem of the 1956 Hungarian revolution. 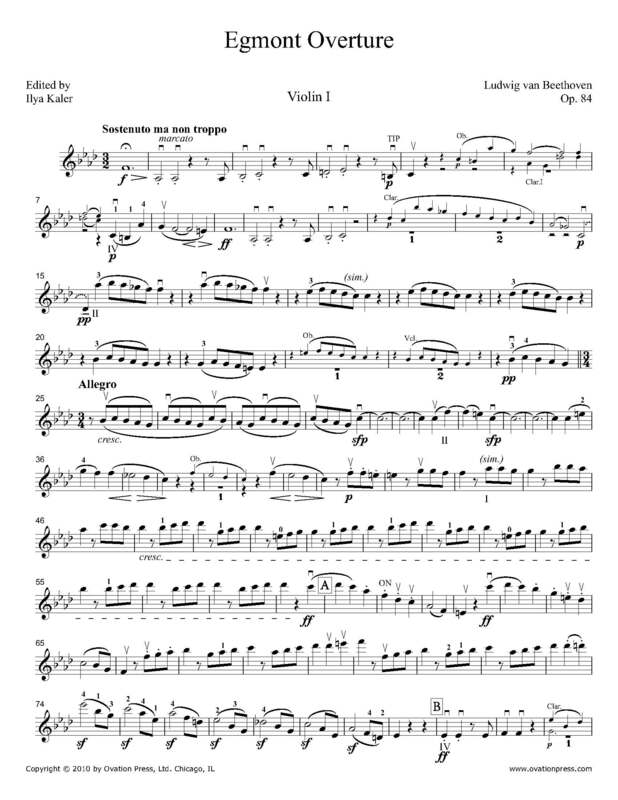 Download and print the score today to gain access to expertly edited Beethoven Egmont Overture violin fingerings and bowings from Ilya Kaler!